The summit will be exclusively for mayors and city council members located within Jefferson County, and only 60 slots will be available. This session will be for those seeking to understand and grow their community’s retail and restaurant businesses. 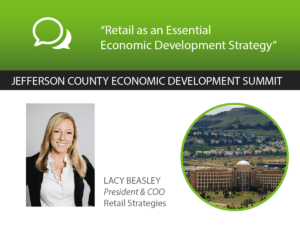 Discover how retail today is a catalyst for economic development fostering a critical base to a vibrant community and strong workforce. Learn the consumer shopping trends that drive profits impacting real estate decision for opening and closing locations. Find practical tips on best practices in developing your community’s retail recruitment program.